Cam's Cinematic Episodes: Film Review - RACHEL GETTING MARRIED: Worth Committing To! Film Review - RACHEL GETTING MARRIED: Worth Committing To! The chaotic swirl of pandemonium that surrounds the average wedding ceremony has long been a popular focal point in cinema. It’s a durable scenario, one that has been played for laughs in romantic comedies ranging all the way back to Hollywood’s Golden age. From Katharine Hepburn’s flighty serial bride in The Philadelphia Story, to Steve Martin’s flustered Father of the Bride, leading into the recent spate of “Wed-coms” (27 Dresses, Made Of Honor, The Wedding Date), audiences have regaled in watching fictional people panic in the face of lifelong commitment. But, as we all know, real life typically paints a much more intense portrait of nuptial ceremonies, where t rain-wrecks in the form of last minute scheduling disasters and soused speech-makers can lead to misery for the organizers and awkward amusement for the guests. 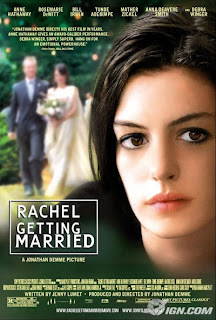 Screenwriter Jenny Lumet (daughter of legendary director Sidney Lumet), has obviously experienced her fair share of wedding D-days, and has compiled and moulded these memories into Rachel Getting Married, a searing debut film that should earn lead Anne Hathaway an Oscar nomination. 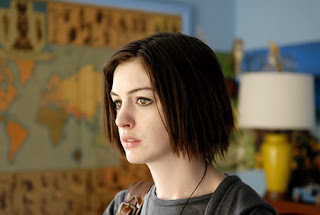 Hathaway plays Kym Buchman, a despondent former model and recovering drug-addict, who leaves the supportive confines of rehab to take part in her older sister Rachel’s wedding party. Nevertheless, things do not go smoothly for the venom-tongued out-patient, as her manipulative tendencies and emotional neediness only add to the tumultuousness of the impending proceedings. Through his voyeuristic lens, director Jonathan Demme (Silence of the Lambs, Philadelphia) tracks the family’s dramatic journey, from rehearsals to reception, delving deeply into both our heroine’s shattered psyche, as well as the secrets which dwell within the dark shadows of the Buchman clan’s troubled past. One of Rachel Getting Married’s most striking feats is in how Demme and cinematographer Declan Quinn have blurred the line between fictional and documentary film-making. The movie has a surprisingly life-like quality, where intimate hand-held footage creates the illusion that we the audience are actually experiencing the on-screen events first hand. This effect, which feels fresh and original, forces us to invest ourselves in the characters’ emotional highs and lows, and builds uncomfortable scenes, such as Kym’s inappropriate rehearsal toast, in to seat-squirming triumphs. However, what really sells Demme’s method-of-madness is the naturalistic performances he’s drawn from his mostly unknown cast of character actors. Much attention has deservedly been heaped on Hathaway, whose wounded doll eyes, pale complexion and rather gaunt figure form a vivid physical representation of abuse. Kym isn’t just a wounded pariah; she’s often vicious and hurtful, desperate to make others feel her own twisted sense of internal struggle. Watching her sad attempts to drag attention away from Rachel (Rosemarie DeWitt, a perfect foil who simmers with barely suppressed frustration), or engaging in a wrenching squabble with her emotionally withdrawn mother (Debra Winger, set for a comeback), Hathaway vanishes into the bruised skin of her character. Almost equally as brilliant is Bill Irwin, as the conflicted Buchman patriarch, Paul. Irwin, best-known, it would seem, for playing Mr. Noodles on Sesame Street, is exceptional as a father struggling to stay on equal footing with his often irrational daughters. He’s funny in little moments, such as in a giddy reaction to a surprise announcement, and remarkably compelling when he has to reveal the buried emotional truths of his character. If justice of any kind exists in Hollywood, Irwin won’t be overlooked when awards season rolls around, as he is the film’s greatest discovery. Also worth mentioning is Mather Zickel, as best man Kieran, a fellow recovery case, who has made peace with his demons and acts as a source of support for the near-fracturing family. He’s a warm presence who understands Kym’s torment, and the two have a very interesting relationship that is entirely free of false moments. If Rachel Getting Married has a flaw, it’s that Demme’s persistent quest for realism slightly drags down the last quarter of the picture. Wedding receptions aren’t particularly entertaining to attend in real life, much less in docu-drama style, where we can see only so many scenes of anonymous people dancing and socializing before fatigue sets in. It’s a testimony to the filmmakers’ vision that the characters are so three dimensional and absorbing that we can’t stand being taken away from them for too long, and these sections occasiona lly do just that. With that minor quibble aside, it’s hard to find many flaws on display here. Demme and Lumet have managed to re-explore the tired themes of suburban dysfunction in a way that is poignant, funny, frank and, ultimately, pretty moving. From the point of view of someone who has been bored witless by his fair share of on-screen and off-screen weddings, Rachel Getting Married is well worth a speedy RSVP. *Originally printed in SFU's The Peak: Oct. 13th, 2008.